Some of my happiest memories as a child were when my big brother and I would make a den. We would get a big sheet and tuck it down the side of the radiator and then pull it across to my bed, it made the perfect hideaway. We would spend hours playing make believe games…but it always collapsed and we would have to keep remaking it! A few years later…ok, a lot of years later I was browsing the wonderful world of social media and came across the most gorgeous Teepee I had ever seen. It was from a lovely online shop called Just for Tiny People, which is just the cutest name. I remember thinking how I wished I could be little again and have one of those for Christmas. But, I stored it away in my baby brain for a time when my baby Alice would be big enough to enjoy some magic. Fast forward to the day that we welcomed Holly into the world and brought her home for the first time. We tucked an excited Alice into bed and collapsed on the sofa, exhausted but so happy to be home with our beautiful Holly. We switched on the television and we were just in time for Dragon’s Den, which we loved to watch. I was feeding Holly and in a bit of a daze, giving birth can do that, when suddenly there was Effie, the wonderful lady behind the magic on my television. I can remember shouting at my husband, I love these Teepee’s and I have been following her story. I was so happy when Deborah said ‘Yes’! I then started writing my blog and I was so excited when Effie said she would love to appear in my Meet A Mum series, you can have a read here to find out more about this inspiring lady. So, you can imagine my delight when Effie asked if my girls would like to try out one of her magical teepee’s, we jumped at the chance. All those childhood memories came flooding back and I couldn’t believe they were going to have an actual hideaway and not have to use mummy’s sheets. The magic began the minute the parcel arrived, covered in it’s bright pink stars, it caught Alice’s attention and she knew this was not going to be a boring parcel. It came pre-assembled, all I had to do was open out the legs and the teepee was ready to be played with. This is perfect for any family and it certainly made my husband happy that he didn’t need a screwdriver. The minute you stand it up, you can tell it was lovingly made by hand, the detail is beautiful. Ribbons carefully tied around the top and bottom of the poles, giving it the magic touch. 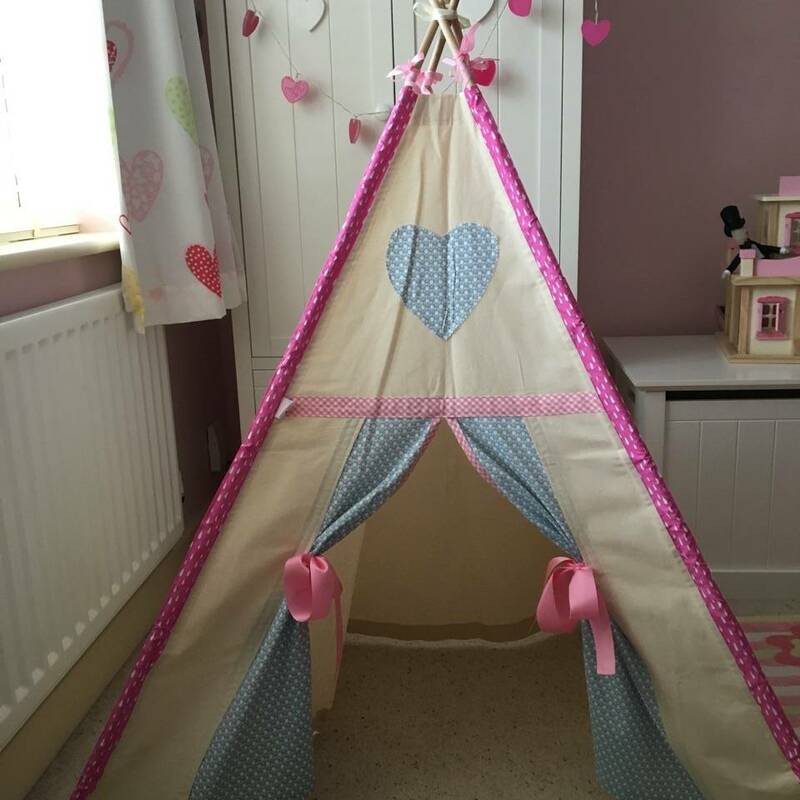 The curtains that you can easily tie back, our teepee had a lovely heart detail on the front, which Alice told me matched her bedroom perfectly. 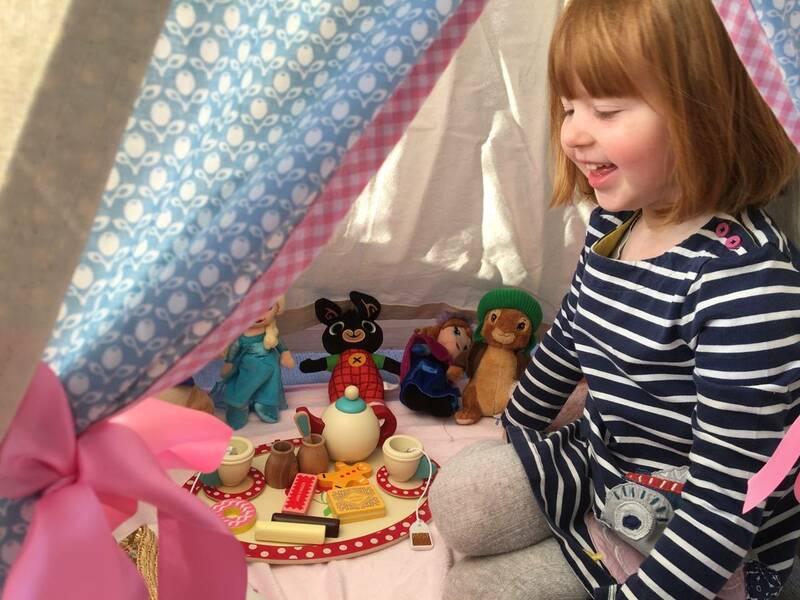 Alice rushed off and came back with her teddies and tea set, telling Holly that they could have a tea party in the teepee. I took some photo’s and then I left them to it, so that I could just secretly listen to what they were doing. 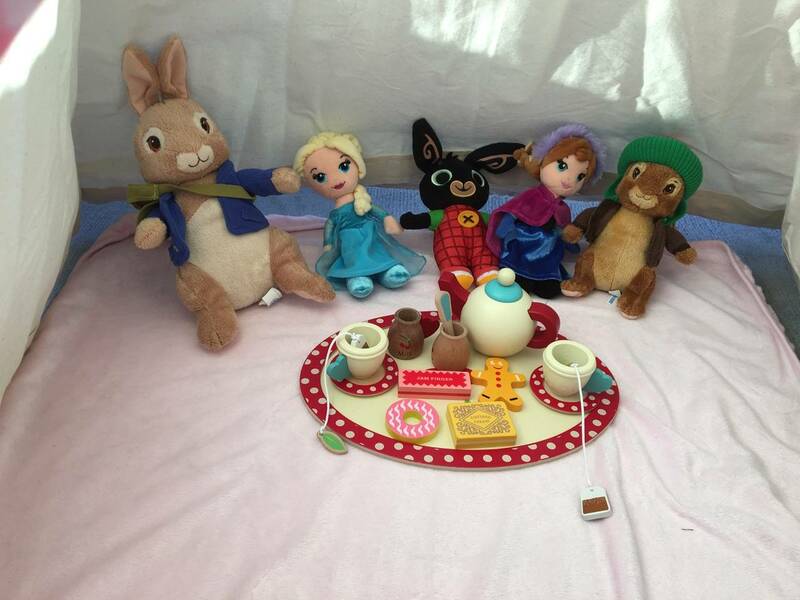 It totally melted my heart to hear Alice chatting away, asking Holly if she would like a cup of tea and Peter Rabbit if he would like a gingerbread man biscuit. A couple of days later when Alice was at preschool I was upstairs doing mummy jobs and Holly was happily playing. When I caught a glimpse of her heading towards the teepee, with a book in one hand and teddy in the other. She crawled in and sat down to read her teddies a story, it was adorable. 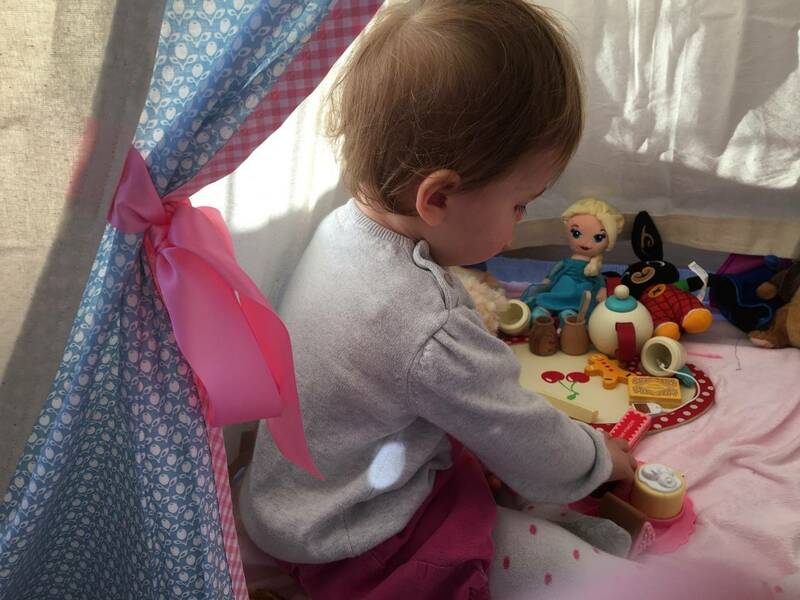 I just know that my girls are going to have such magical times with their teepee and Alice is already asking if we can take it in the garden when we have a sunny day. 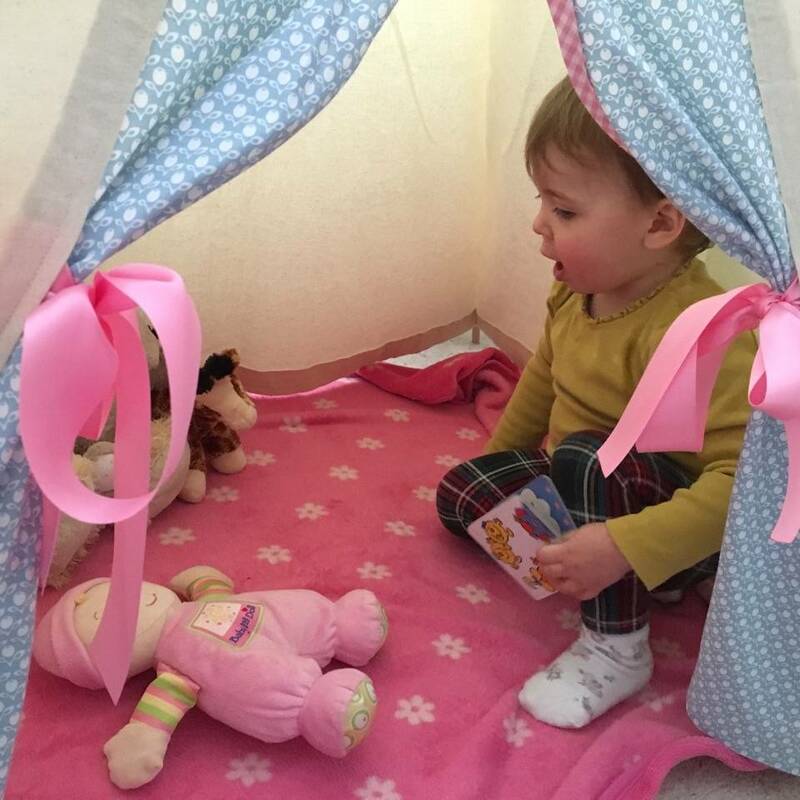 That is another one of the great things I love about the Just for Tiny People Teepee’s, you can easily fold them up and carry them to any part of your house or garden. If you take a peek at Just for Tiny People website, which in itself it like going on a magical adventure, as the teepee doors open and you step inside. You will see that they have a large range of designs and there is something for everyone. Plus they also make lots of other magical items and accessories, check their shop out here. Disclosure: I received the Teepee for the purpose of this review, however all opinions are my own. I love these so much – I have similar memories of my sister and I making dens with sheets and chairs when I was little and I think the nostalgia factor is a big part of the appeal for parents. But they’re such a huge hit with kids, it’s amazing. I love your little one just taking her teddies off for a story – too cute! I’ve been trying to think of a space we can fit one of these in but I’ve not come up with one yet. And they’re too lovely to be an outdoor toy! That teepee is just adorable…It looks so pretty. This is the cutest post ever! Between the teepee and the girls, cuteness personified 🙂 I adore the teepee, it’s really lovely. My girls had a teepee when they were little and they got so much fun out of it. It’s such a great tool for the imagination too as they can be tucked away in a little dream land. I love these! They look amazing and so much fun. I went and had a look at the website which is brilliantly designed and fun to look at but sadly the tee pees and waaayyy outside my budget. Think I’ll have to stick to a sheet over a table. oh my goodness, this is just adorable! I love the co ordinating things you can get. Kids really do get so many exciting things to play with these days, I’d have loved this when I was little. I remember making dens as a kid too. We always used to put sheets over the kitchen table! This teepee looks like the perfect little den for your girls.